This easy to make Weight Watchers appetizer recipe is a must do for your Christmas or Hanukkah party this year. They are elegant and sophisticated in appearance and taste AMAZING! The fig and Gorgonzola combination goes so well together, and gives this appetizer such a seasonal, holiday flavor. And it tastes so incredibly rich and decadent. It’s the perfect little finger food recipe! And with just 1 Weight Watchers Point for 3 of these beautiful little gourmet goodies, you can enjoy quite a few of them without any guilt. What I like a lot about this dish, is that it’s very unique appetizer recipe, and it will give your guests a chance to try out something deliciously new. Plus, they take very little effort to prepare, so you can whip up an impressive batch in a pinch. If you are looking for an exciting new Weight Watchers Appetizer Recipe to serve up at your holiday dinner or party this year, give this one a try! Blend together cream cheese and Gorgonzola cheese. 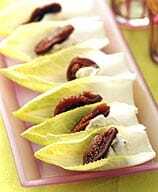 Top the base of each endive leaf with about 1 teaspoon of cheese mixture and 1 piece of fig. (If you’re a handy baker, pipe the cheese mixture onto the endives through a pastry bag, for a bit more decorative flare.) Serve and enjoy!